Had a bit of time to check for evidence of communities thinking about forming parish councils. Queen's Park have been successful and will form a parish council in 2014. But what of the other attempts? I can find fifteen and all are at very different stages. The earliest stage of forming a parish council appears to be a period of discourse. This is often internet-based and then spills over into local newspapers, or is triggered by a local politician and perhaps involves correspondence with the local council. The setting up of a dedicated website or Facebook group is an indicator things are moving along and that there is someone driving the proposal forward. Things are really getting serious when there is a public meeting. London Fields and Wapping have reached this stage, but not beyond it. Only Queen's Park have successfully moved to the stage of petitioning the local council for a governance review. But what do these prospective councils point to? Firstly the geographical spread is interesting. 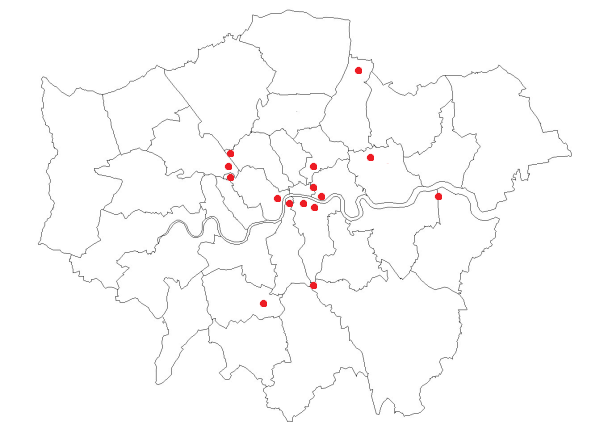 Not only are the majority in the Inner London area that has no history of parish councils, but many are on the central London fringe. Only Chingford fits the anticipated profile of a community on the Greater London boundary looking to copy the experience of communities on the other side. Often the desire to form a council references something about identity and difference to "the rest" of the borough in which the community is situated. Communities on edges and boundaries (Crystal Palace, Forest Gate, Kilburn and Thamesmead) are notably present. But parish councils cannot cross borough lines and cannot be used to ameliorate for the effects of London's often arbitrary (although often ancient) borough boundaries. It would be wrong to suggest people want to form parish councils for political reasons, but often the political profile of these areas differs from the rest of the local authority. Back to the question "Who will be next...?" It is hard to say, as no community seems anywhere near as driven as the Queen's Park campaign. The most activity appears to be around the idea of councils in the north of Southwark, which is interesting as this borough has the most significant devolved area committee arrangements in Greater London. Has this experience been enough to convince the community they want more? Depending on the council election result next May, I'm planning on driving a town council proposal for Roehampton, in LB Wandsworth. Launching the idea in the January edition of my newspaper (see website for details). Exact boundaries to be decided. Thanks. I'll keep an eye on that.